About 80 percent of the way through the 2006 Martin Scorsese picture The Departed, Leonardo DiCaprio’s William Costigan, the ostensible hero of the film who’s gone under deep, secretive cover in the Boston mob, gets abruptly shot in the head. He dies without glory and before he has a chance to take down his bad-guy reflection (Matt Damon), the mob associate who has infiltrated the Boston State Police. In the world of the movie, full of tightening screws and ruthless violence, this makes sense. In the world of movies in general, however, it feels all wrong. DiCaprio is one of the biggest movie stars to emerge in the past 25 years, and his exit from The Departed is not a movie-star death. In fact, other recent stars of DiCaprio’s magnitude rarely die on screen at all; if Will Smith or Tom Cruise is going to buy it on screen, their deaths will be noble, sacrificial, or nobly sacrificial. (Even more likely, though, they’ll be saved at the last minute; Cruise in particular has gained notoriety for rarely dying on screen.) None of them will be unceremoniously shot in the head by a minor character. In The Departed, Scorsese takes advantage of this jarring wrongness, and the sense that the biggest star in the movie will play someone who will be safe from the cruelest twists of fate. He uses an enormous movie star to make a gangster thriller—one that is for much of its time intense but also a lot of fun—feel dangerous, even ruthless. DiCaprio’s willingness to plug his movie-star wattage into that electricity and still cap the role with an unceremonious death explains why he’s made such an excellent match as a late-career collaborator for the legendary director some three decades his senior. If the recently announced adaptation of The Devil In The White City comes to pass, with Scorsese directing and DiCaprio producing and starring, it will mark their sixth movie together, putting them in spitting distance of Scorsese’s eight-film run with Robert De Niro (which ended, at least for the time being, with the now 20-year-old Casino). Though uniformly successful at the box office, the run of Gangs Of New York (2002), The Aviator (2004), The Departed (2006), Shutter Island (2010), and The Wolf Of Wall Street (2013) has yet to attain the same mythic cachet in its time as Scorsese’s collaboration with his previous and similarly named muse, Robert De Niro. The Scorsese/De Niro partnership galvanized audiences with the physical and psychological transformations of movies like Taxi Driver and Raging Bull; it’s safe to say that Scorsese/DiCaprio movies, while usually in receipt of good critical notices, are not quite so well-regarded. Despite his working-actor patterns over the last 25 years, De Niro is a living legend. DiCaprio and other members of his generation aren’t as flinty, steely, or rough-hewn as their ’70s cinema counterparts (a sentiment most recently echoed by Anne Hathaway, playing the mouthpiece of Nancy Meyers in The Intern, also starring De Niro). DiCaprio in particular has the kind of youthful good looks that can contribute to a sense that the star who has helped Scorsese become a more bankable director is a sort of pretender to De Niro’s throne—the kid who slipped in while the real star was out using the restroom and/or making dopey comedies, and now refuses to leave the table despite not having a character as indelible as Travis Bickle up his sleeve. A rivalry probably doesn’t exist between the actors themselves; De Niro actually introduced Scorsese to his This Boy’s Life co-star, and the three even made a short film together, in which the two actors apparently jockey for the same role for the director. Nonetheless, it’s easy to imagine Scorsese’s peer De Niro doubling as his id up there on screen; less so with the younger, softer DiCaprio. Yet the DiCaprio/Scorsese relationship has become enormously productive for both artists, helping to define both of their careers for over a decade and, as such, becoming a vital part of Scorsese’s development as an artist. Though it would be easy to read their frequent reteaming as an ongoing mentorship, they’re actually mutually beneficial: DiCaprio expands Scorsese’s palette, while Scorsese applies his personal signature to the kinds of big, serious, adult-minded movies DiCaprio actively pursues. This may sound suspiciously like compromise, especially when movies like Taxi Driver and Raging Bull feel torn straight from the filmmaker’s soul, regardless of their actual origins. (Bull, for example, being a project De Niro brought to his friend and collaborator during a particularly dark period in Scorsese’s life, just as DiCaprio has approached Scorsese in less tumultuous times.) But Scorsese’s late-period breaks from dream projects have represented some of his best and most varied work; none of his recent films are as spectacularly misguided as, say, New York, New York, a fascinating and worthwhile Scorsese/De Niro folly that’s nonetheless kind of unpleasant to actually watch. Scorsese and DiCaprio came closest to this kind of fever-dream madness in their first film together, 2002’s Gangs Of New York, in which a late-20s DiCaprio (then returning to movie screens after a nearly three-year absence, with films by Scorsese and Spielberg in near-simultaneous release) was soundly and roundly overshadowed by Daniel Day-Lewis. Day-Lewis made an even more dramatic return (five years gone) with a far showier part; he plays Bill The Butcher, the nativist gang leader who murdered the father of Amsterdam Vallon (DiCaprio). Much of the 1860s-set movie, nominally about Vallon seeking revenge, often finds the younger actor standing off to the side, observing and seething as Day-Lewis does his thing, which here involves wearing a top hat and speaking with a transfixing early mid-Atlantic accent. Day-Lewis isn’t the only element of Gangs Of New York that overwhelms DiCaprio’s scrappy, slightly outmatched performance. The whole movie is a glorious sprawl, a breathless history of 1860s New York City that rolls together Tammany Hall corruption, pulpy clashes, bloody racial divisions, and the resulting Civil War draft riots that eventually overtake the final showdown between Vallon and Bill. DiCaprio’s way into the movie’s vast ambition turns out to be the possibly Harvey Weinstein-mandated narration that lays out the specifics and relationships of the movie’s setting. In the annals of Scorsese narration tracks, DiCaprio does a more workmanlike job than, say, Ray Liotta in Goodfellas; the color comes from the content of what he’s explaining (which is often fascinating) more than his delivery of that explanation. In keeping with the rest of his performance, he serves the movie steadily, without Day-Lewis’s crucial flourishes. In retrospect, this reticence is an odd quality for DiCaprio, because he has a reputation for telegraphing his hardest work—for sweating out demonstrative performances that lack the effortlessness of the all-time greats. But it’s not always bad to see an actor sweat a little, and Scorsese has harnessed that striving quality in DiCaprio better than almost any other director and physicalized it, too. His transformations aren’t as impressive as the ol’ De Niro weight gain in Raging Bull, but Scorsese’s intensity has a way of fraying at DiCaprio’s default seriousness, rendering it both more vivid and more vulnerable. In The Departed, DiCaprio plays his ragged, ever-increasing paranoia to the hilt, with the kind of hair-trigger desperation usually associated with actual underworld types, not a good guy pretending to be bad. He’s very much a “rat in a maze,” a description later applied to his character in Shutter Island, which also puts him through the wringer with a Boston accent. Scenes in the second half of The Departed between DiCaprio and Jack Nicholson’s kingpin have both characters playing more paranoid and vulnerable than they appear early on, and Scorsese uses Nicholson’s unhinged persona masterfully opposite his younger, more workmanlike costar. In these passages, Nicholson plays a cracked reflection of what life under constant scrutiny of cops and crooks might look like, while DiCaprio stays rooted in the moment, holding the center (if only sometimes by his fingernails) in a way he doesn’t opposite Day-Lewis. Even seconds before his final fate is decided in that heartbreaking death scene, his Costigan never appears beyond help. The Departed comes closer than any of the pair’s other films to one of Scorsese’s past gangster classics, though it’s markedly different from the far more similar Goodfellas and Casino (and great as those are, none of the DiCaprio films are as similar to each other as those two). Their other crime movies go further afield: Gangs Of New York views crime through a historical lens, while in The Wolf Of Wall Street, the gangsters aren’t technically underworld types at all. Nonetheless, DiCaprio shows the strains of swagger maintenance on financial hustler Jordan Belfort, who’s not pretending to be bad (he just is) but can’t stop selling himself and his ridiculous lifestyle. As the movie goes on, Belfort seems to run on fumes at times, but never quite runs out of them; his smooth talk itself is less impressive than its relentlessness. Again DiCaprio echoes Liotta in Goodfellas, except instead of engagingly explaining how this criminal enterprise works—several times he interrupts his own analysis—he goes straight to the cocaine bender. In one of the best moments of DiCaprio’s career, Belfort sets out to deliver a farewell address to his firm of Stratton Oakmont, in order to lay low and avoid possible jail time… before working himself into a defiant froth, deciding in the moment that he will not step down. The interplay between DiCaprio’s movie-star charisma, his sweaty effort, and Scorsese’s restless camera (panning across Belfort’s adoring audience) gives the scene its charge. Unlike Liotta, DiCaprio has the aura of a man who could will himself to succeed. This quality is also distinct from De Niro, who often plays characters who, if anything, will themselves to fail—whose success, when it happens, prompts questions of whether it’s some kind of hallucination or cosmic joke (as with Taxi Driver and its companion, The King Of Comedy). There’s a source for DiCaprio’s swagger; Titanic turned him into a major movie star at a young age. The movies he made immediately after Titanic, while often shepherded by strong directors, played on his youthful charm: the excitable backpacker of Danny Boyle’s The Beach and the self-satirizing enfant terrible of Woody Allen’s Celebrity. He’s good in both of them, but better assays those qualities when Scorsese capitalizes on his energy in The Aviator, the Howard Hughes biopic that worked so successfully as Oscar bait (Scorsese didn’t win, but Cate Blanchett did, along with the editing, cinematography, costumes, and art direction) that it’s easy to overlook how damn good it is. Among many lovely technical touches, Scorsese pays homage to its period’s filmmaking with an imitation of early color techniques that leaves the first half of the movie bathed in rich blues (and, secondarily, reds). Though it’s meant principally to reflect the time period and ambitions of Hughes, the color scheme also fits with the movie’s star; much of the first half of the film looks like it’s taking place inside DiCaprio’s blue eyes. He’s doing his best to imitate Hughes, but the character comes out plenty Leo, with his jabby hand gestures and lanky posture—he lends Hughes some of his contemporary star power, and that accompanying will to succeed. This probably isn’t a role that De Niro could have played for Scorsese, even in his youth; hell, it’s not even a movie Scorsese would have likely made at all without DiCaprio, who brought him aboard to replace Michael Mann. This is not an uncommon setup to their post-Gangs work together, positioning Scorsese as more of a talent for hire than he had appeared in the past. 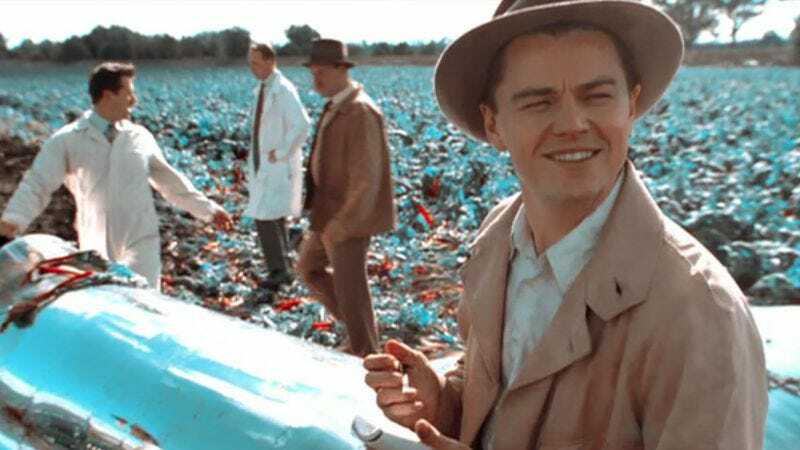 The Aviator’s evocations of Old Hollywood glamour are reflected, in a way, by the star-packed cops-and-robbers thrills of The Departed and especially the genre-heavy Shutter Island, which filters older horror movies and film noir through Scorsese’s immediacy. Speculation about filmmakers’ motivations can be a fool’s game, but sometimes it seems that if left to his own devices, Scorsese would spend even more of his time struggling to make passion projects like The Last Temptation Of Christ or the upcoming Silence. DiCaprio, then, steers Scorsese into the kind of adult-targeted mainstream studio filmmaking that supposedly doesn’t happen much anymore. These newer Scorsese movies aren’t as hard-edged as his De Niro pictures, it’s true, but they often allow Scorsese to indulge a cinematic lushness worthy of the star so often at the center. Here’s a dirty secret about the ’70s movie brats: Having established their voices, they’ve often proven capable of terrific for-hire work. If DiCaprio is goading Scorsese into mainstream filmmaking, it’s because he goes after legacy movies with impressive consistency. He isn’t alone in these pursuits; a moment of appreciation, please, for the superstars like DiCaprio, his Departed co-star Matt Damon, and their Departed producer Brad Pitt, who steadfastly work with strong directors and rarely do sequels not directed by Steven Soderbergh. Some of these guys also get to share a certain sort of nostalgic ire; though the former teen idol tends to get it worse, there have been countless essays and quasi-think pieces over the years about a contemporary dearth of real leading men. Sometimes this is framed as a national import/export crisis (why are all of the superheroes played by Brits? ); sometimes it is framed as a generational shortfall (DiCaprio, Damon, and Ben Affleck don’t look weathered enough from all their soft, pampered living! ); and sometimes it’s looked at from a business perspective (Will Smith was the last real movie star and now he’s done). What these arguments have in common is their inherent conservatism—their implication that, for whatever various reasons, things aren’t the way they used to be, and that is cause for concern, or at least a backward-looking lament. DiCaprio has time for plenty more wringers; if current trends are any indication, he’ll probably act well into old age. The likes of Cary Grant and Jimmy Stewart were semi-retired for the last two decades of their respective lives, while current seventysomething stars like Al Pacino and De Niro show no signs of easing up their schedules (and are often rewarded for their diligence with complaints about how they’re somehow not electrifying audiences the way they used to). All of this is to suggest that yes, someday Leonardo DiCaprio will probably, finally play an old man. By that point, hopefully he’ll have built up an undeniable body of work, and younger actors will be compared to him. But it shouldn’t take that long. The films of Scorsese and DiCaprio aren’t sell-out time killers on Scorsese’s way to making another gangster movie, another De Niro movie, or even another movie where he can use “Gimme Shelter” (although at least one of those will probably come to pass before his career ends). They’re the boyish, excited face of what big-studio filmmaking ought to look like. Next time: Two of Hollywood’s biggest names bring out each other’s squareness.